Become a New Member of IANDS! Already a member (renewing)? Click here. To join online as a new member, follow one of the links below. To join by mail, phone, or fax, instructions are provided at the bottom of this page. 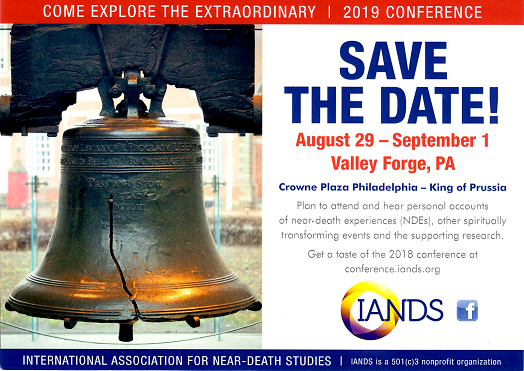 For over 35 years, IANDS has been encouraging independent research into NDEs and educating the world about near-death and similar experiences -- and their effects and implications. It has been the foremost consultant organization on the subject to radio, television, film, and the print media; it provides publications and conferences, sponsors local groups, has sent hundreds of speakers to audiences worldwide, and reaches out in person and online with reliable information and support. It has helped change the public perception of what it is like to die. Your membership helps provide the financial support for IANDS to pursue this mission. In return, IANDS will offer you insight into near-death experiences through our website, magazine and journal, conference and educational offerings, and e-mail services. We'll deliver an NDE account to your email box every month. We'll keep you abreast of the latest research, media coverage, and how the near-death experience is being interpreted by researchers and thinkers around the globe. Wherever in the world knowledge from NDE research and scholarship reaches, and wherever compassionate people educated by that information are able to offer understanding and support to their community -- that is IANDS in action. We truly look forward to having you as part of our organization!